Forgive the Upworthy-esque headline, but I wanted to get your attention. 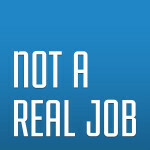 Not a Real Job is a better kind of marketing podcast. It’s actually fun. And funny. And useful. Hosts Chris Van Patten and Joel Kelly answer your questions and share their wisdom on all things digital marketing, small business, writing, productivity, social media, and more. Plus, there are plenty of good drinks and bad jokes. Always hilarious, often insightful, Not a Real Job is your new favorite podcast, and the best thing to happen to your business’s online marketing. What you may not know is that the show is now completely free. We experimented with charging for the show in its early days, but we decided to unleash the episodes to the world so we could reach an even larger audience. You can grow that audience by subscribing to the show on iTunes and sharing our latest episode with your friends. That episode, number 23, is a discussion about whether or not Kids These Days are leaving Facebook (and—more importantly—whether it even matters for digital marketers). It’s a fun episode, and a fun show, and I hope you check it out.